Labor Day brings with it an annual puzzle. Why does the observance of this American holiday have little or nothing to do with labor? Some say the cause is the substantial decline in union membership over the past several decades. Another reason cited is that Labor Day has become a three-day holiday, a time for shopping trips and short vacations, with no opportunity to reflect on labor’s history and prospects. A far more fundamental reason for the decline of Labor Day observance is that the dominant national narrative is preoccupied with consumption and business. The public story we tell ourselves and our children is getting and spending, not working and building. 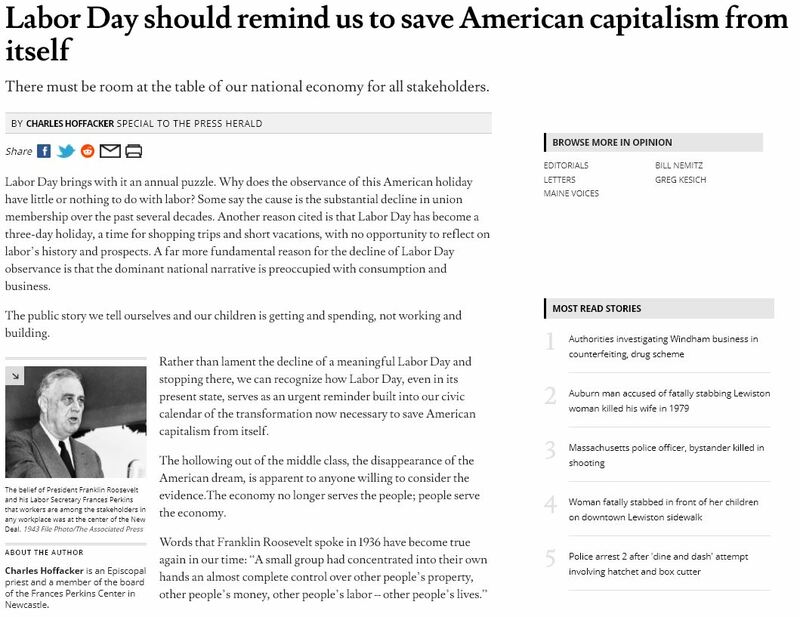 Rather than lament the decline of a meaningful Labor Day and stopping there, we can recognize how Labor Day, even in its present state, serves as an urgent reminder built into our civic calendar of the transformation now necessary to save American capitalism from itself. The hollowing out of the middle class, the disappearance of the American dream, is apparent to anyone willing to consider the evidence.The economy no longer serves the people; people serve the economy. American capitalism should do more to promote the welfare of the American people. If it is to survive, if the nation is to survive, drastic reform must take place. This reform will have many facets.One such facet is the widespread recognition that workers are among the stakeholders in any workplace and thus deserve an active role in that workplace, a role consonant with their human dignity. This belief of President Roosevelt and his Labor Secretary Frances Perkins was at the center of the New Deal. A view currently advocated by special interests takes into account only shareholders and management. Profit for shareholders (including top management) is seen as the only reason for a business enterprise. This view is blind to the roles, rights, and obligations of other stakeholders, among them workers, customers, society, government, competitors and the environment. Concern for shareholder value alone is a dangerous example of tunnel vision. It promotes an insistence on making money that overlooks the need to provide people with goods and services. It fails to recognize the obvious truth that the labor of human hands and hearts and minds is an essential element of personal and social existence. There must be room at the table of our national economy for all stakeholders. As every other sort of stakeholder often functions collectively, so too workers often need to be organized. Their right to establish and join unions to engage in collective bargaining must be recognized as a principle of morality and law. No human organization, including labor or management, needs to be flawless to be legitimate. Organized labor has contributions to make in our society’s current pursuit of the common good. Where organized labor is effective, all workers prosper, whether or not they belong to unions. Don’t regard Labor Day 2017 as a holiday without significance. Recognize it as a stubborn reminder of something that can save American capitalism from its own excesses and wrong turns. Picture the decision-making table in workplaces as one with seats for all stakeholders, not simply a few. Do the same with our national economic conversation. In addition, join me in adjustments of language that promise something good for the future. For example, I no longer speak of “private enterprise.” This term overlooks how any business or industry, whoever owns it, depends on public infrastructure to survive. This infrastructure includes everything from the judicial system to roads and bridges. I also generally avoid using the term “employees.” It places people in a passive role: “employees” are people employed by somebody else. Speak of these same people instead as “workers,” whether they wear business casual or overalls. “Workers” is an active term, a strong and dignified word. Such changes in how we think and speak can be one small but important step in saving American capitalism from itself and promoting the public good. Give it a try!